A comment on the image. In order to read the bible, we need physical light. In order to understand the bible, we need divine light. Both these lights are gifts from God. And because this website is Thank-Your-Stars.com, I have the text coming off the pages and going heavenwards and coming back as little blue stars, symbol of the insights and graces that we should give thanks to God for, whose Son - His Holy Word - came down from heaven to show us the way up to heaven. The candle is purple for the Advent season. 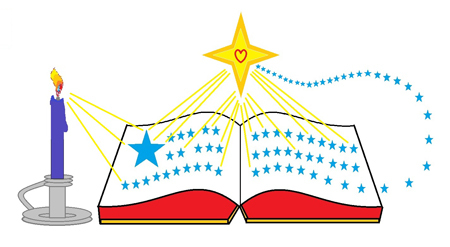 The blue stars are 5-pointed stars to honor Christ's birth in Bethlehem. The gold/yellow star at top is in the form of a cross, by which Jesus opened the gates of heaven to us. The heart in the center of the star cross is a symbol of Christ proving his love for us by the greatest sacrifice of dying on the cross, on which his heart was pierced. individually - for personal reading, reflection, and spiritual growth. ... all the way to poems, stories and projects that even children can understand and benefit from, whether at school or in the home, whether on Sunday or throughout the week. ... along with practical tips and ideas for parents, teachers, and pastors - taken from my years of experience and studies - to help make the bible come alive in our lives. ... whether it's a national or religious holiday like Thanksgiving or Christmas, or a personal event such as a wedding, a birthday or anniversary, a graduation or a funeral - to name just a few. For example, Mother's Day is a teachable moment for us to understand the role of mothers, to encourage mothers, to pray for mothers, that children are to honor, love, respect, and obey their mother. In fact, there's all kinds of valuable lessons for all of us, even those who don't have children or are not married, because we each have a mother. And even if our mother's are gone or deceased, we still should honor their memory and show our gratitude at the very least by our prayers of thanksgiving to God. Children grow up so quickly. Life is so short. If we're going to teach, we might as well teach the very best. The best teaching in the world comes from the bible. We don't have to learn the hard way. Life is too short to have to learn the hard way. God wants us to prosper, and loves us so much he wants to save us from a lot of trouble learning the hard way. God shortened our learning curve drastically. He sent his son not only to teach, but also to take our burdens and make it easier and possible for all of us to enjoy a happy fulfilled eternity - which was not humanly possible before. So when we read that Cain killed Abel (Genesis Chapter 4), we find out that it started because of anger. Then we see the terrible consequences of the crime, and by God's grace we learn that we'd better avoid that. And because we're all sinners, we need a Savior, and that is what Advent bible studies is all about. Advent Bible Studies - the Whole Bible? He already came as a child on Christmas. He comes to individuals who receive him. He will come to judge the living and the dead - at the end of our lives and in his second coming at the end of the world. Because at least one of these comings is in the future, all of the bible scriptures are written for our instruction to live and die prepared for his coming. In fact, in some denominations, there are readings on the First Sunday of Advent taken from Jesus teaching on the end of the world, when Jesus comes as judge. Advent is rather short, only four weeks long at the most, and 3 weeks plus 1 day at the least. So here's some suggestions for a basic outline starting with the Old Testament. Prophets, such as the Psalms of David and Isaiah, especially portions predicting the coming of Christ. Also the Prophet John the Baptist. Some denominations read a portion of the Gospels relating to John the Baptist on almost every Sunday in Advent, both the life, teaching, imprisonment and death of John, and the words Jesus said about him and to him through messengers while John was in prison. John the Baptist is a predominant figure in Advent, being the greatest prophetic messenger immediately before the public appearance of Christ at the age of 30, being sent to prepare the hearts of the people to receive Christ and his message. Some Advent seasons are shorter than others. When Christmas is on a Monday, the 4th Sunday of Advent is Christmas Eve, and Christmas starts that night at midnight. So you may have to adapt your bible study schedule accordingly. We have to realize, Advent is rather short, 22 to 28 days long. If you're a pastor, that leaves only four Sundays to give sermons. If you're a teacher, that gives about 15 to 18 days or so. Then if you count Christmas vacation starting a few days early, there goes a few more days. And if you live in a place like where I used to teach, sometimes school is canceled because of cold, snow, or bad road conditions. Then throw in a few sick days, both for the teacher and children, because it's that time of year, and your really aren't left with many days. So make the best of it and make each of them count. One advantage, is that we had bible history from the very beginning of the school year, a day or two each week, if not every day, and there usually was a Christmas program in the works - Christmas carols or a Nativity play - for several months, and you can see that it was not really that hard to get right into the spirit of Advent with a bit of good planning. The book of Isaiah is very good, and has good Advent themes. The 3 Canticles recorded in the first 2 chapters of Luke also make an excellent Advent study, in fact, they can make excellent daily prayers during Advent. They are the Canticle of Zachary at the birth of his John, the Magnificat of Mary when visiting her cousin Elizabeth after the conception of Jesus, and the Canticle of Simeon when Joseph and Mary offered Jesus in the Temple 40 days after his birth. Also someday I would like to post practical tips for reading and studying the bible. Might as well give you a few right here for now. There are so many ways to learn from the bible. Yet for some of us, it seems so hard, that it helps to have someone give good direction and guidance in this matter to each individual according to their needs and learning style. It always helps to begin with prayer. Pray to the Holy Spirit for guidance before each reading. And if it's hard, help make it easy. If you really want to read a good book, you find a way to make it fun, or easy, or exciting - if you're that kind of person. Or if you need comfort, or solace, you find a friend who understands you. So don't give up because it's hard or complicated. Work at making it better. Get into a good habit. Find a good place. Carve out a good time of day. If you're too busy for God, then I agree, you're too busy. Cut out other stuff. Nothing is more important that your time with God, giving food to your soul. If you really want to, you'll find a way, you'll ask, you'll plead, you'll get on your knees - whatever it takes to chase out the devil of laziness and procrastination. If you fall asleep while reading, pick a better of time of day. If you don't like to read, get the bible on tape or CD. You can sit, kneel, stand, or walk - again, whatever it takes. Why don't you ask God for help? He only created the Universe, he has not run out of creative ideas yet. Children love to color, draw, do things with their fingers. Boys love to run and need more activity. Children like to do plays. They don't even have to dress up. As a teacher, I found some of the best plays are the impromptu ones, done at the moment and just by themselves. Have a play enacting the bible scene. In Advent, Joseph and Mary knocking on doors, and people saying no room. In many Spanish-speaking countries and in places here in America, there is a custom where people go from house to house, even for many days before Christmas, then celebrate with prayers, bible readings, and a little refreshment at each home. It's called Los Posados. It is important that we read or tell bible stories to our children. Stories are one of the fastest ways we learn things. They grab our attention and go deep inside the most primitive parts of our brains. Jesus told stories. The bible is full of stories. A good bible story book for children is a good way to introduce them to the bible and its stories. Parts of the bible - such as genealogies, or the many wars and killings and certain kinds of sins - may not be suitable for very young children. Of course, they do have an important place in the bible. Genealogies that prove the prophecy Jesus is in the line of David, for example. Warnings and examples good and bad for adults. Regular daily exposure to the bible is a blessing. In church, in school, in the home and family, in personal reading and reflection, in studies in oollege. There is so much food for thought, you could never run out of things to learn, discover, find out - especially as your friendship with God grows and deepens and matures. Then when hard times come, your daily Scripture reading and time with God and His Word will prove a great consolation and comfort. You will find courage and strength in areas you didn't think you had, because it isn't your courage or your strength. It's simply God looking out for his friends. Yes, everybody's learning style is different. But it does help to do your studies in a quiet place, avoiding as much distraction as possible, doing it prayerfully, and making it at a regular time of day so that it becomes a good habit that pulls you into doing it faithfully. It helps also to have other friends who also read the bible daily to encourage you - and hold you accountable. Doing it in a group can also be very helpful. But I do encourage you to do at least a little bit on your own each day. Just like there is a place for group prayer, so is personal prayer vitally necessary. Make your reading a prayer. For example, you read something you know God wants you to do, but you think it's too hard. It's impossible. Tell God. That is a prayer. Reading the Bible - Fast or Slow? Sometimes, it helps to get an overview, and read quite a few chapters at a time. Sometimes, it's good to go deeper, and research a portion of a chapter, or even one verse. Or even one word, like the meaning of the word "Praise". Which is very much tied into thanksgiving, when I was looking for Scripture verses of Thanksgiving. Some people find it helpful to read a chapter a day. I used to have a good memory as a child, but, I was probably more proud of getting the words right and looking good, than actually understanding what I memorized. Now, I probably don't have the best memory in the world. But I'm thankful, that over the years, all my exposure to the bible has been a great blessing. It's very valuable, very helpful for children to memorize important bible verses. If they can so easily remember silly songs, far better that they remember God's Holy Word. In some countries, people hunger for every opportunity to read a bible, because they are so scarce, they don't even have one. Or if they cannot read, they listen to the bible being read with great eagerness every chance they get. They walk many miles just to hear the Word of God. They put many of us to shame. In our country, many people have lots of bibles in their homes, but it's doing them no good, because they don't read them. Don't let anything keep you from your time with God in His Holy Word. I had a pastor mentor tell me one time, his rule of thumb was, you could only skip your normal prayers - such as your bible reading - only if you were too sick to eat. We eat, but our bodies will eventually die. Our souls will live forever - or endure an eternal death forever. So if you ate today, did you also feed your soul today? If not, do it right now, before it's too late.